How important could John Campbell’s last-gasp penalty prove to be for Jarrow Roofing? John Campbell’s last-gasp penalty secured a point for Jarrow Roofing at home to Newton Aycliffe. With two minutes of added on time already played, Matty Fisher burst into the box and was brought down. With the pressure on Campbell, the forward rifled the spot kick high into the net giving James Winter no chance. If Roofing were fortuitous to earn a late point, they should have been firmly in control of the game by half time. It took just 68 seconds for the South Tynesiders to take the lead. Campbell flicked the ball on and Dennis Knight raced through from 30 yards out to finish low into the corner. A minute later and the lead could have been doubled but Olly Martin’s shot, having been played in on goal, was smartly saved by Winter and pushed out for a corner. From Knight’s kick, the ball fell outside the box and met by Lee Kerr but the 25-yard strike struck the post as Aycliffe were wilting under the pressure. However, with Roofing playing their fourth game since the previous Saturday, fitness levels were quick to drop. 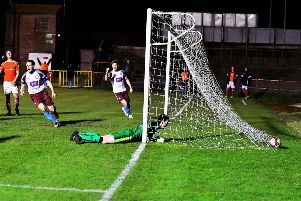 Goalkeeper Dan Regan injured his groin and playing on, was unable to get out of goal to clear a long ball forward with Craig Hutchinson taking advantage to secure an equaliser with four minutes of the first half remaining. The visitors grabbed the lead as the Roofers, dead on their feet, were slow to react inside their own box and Thibault Charmey poked the ball in past Shaun Newbrook, on for Regan at the break. With just nine minutes remaining, Roofing pushed forward and their reward came in the dying seconds through Campbell. Wins for Bishop Auckland and Penrith leave the Roofers four points behind the pair, though Seaham Red Star’s defeat have dropped them to fourth-bottom, a place above Roofing and with a three-point cushion.